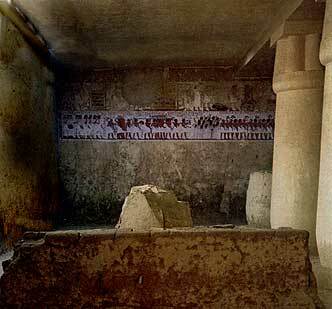 Tomb of Ramose, Theban tomb number 55, discovered 1860. He was a vizier of Egypt during the early years of Amenhotep IV (Akhenaten) - other titles include, "Chief of the Works among the Great Monuments", "Superintendent of the Priests of the North and South", "Master of the Wardrobe", "Master of the Secrets of the Palace", "Head of the Entire Land" . The tomb/chapel of Ramose appears to have been started in the just as the young Amenhotep IV came to power and is unique in showing the two seperate art styles (the traditional and the Amarna style) of Amenhotep IV/Akhenaten - see below. Ramose's tomb was completed for him by his brother, Amenhotep (Steward of the King's Palace at Memphis, Superintendent of the Royal Craftsmen), as Ramose appears to have died without children. The date of his death may be put at roughly the second year of the reign of Amenhotep IV (certainly before the move to Akhetaten as there is not trace of a tomb for Ramose found there). 1 - an official of Amen called Khesy and his unnamed wife. 2 - May - Master of the King's Horses, and his wife Urnure a priestess of Mut at Karnak. 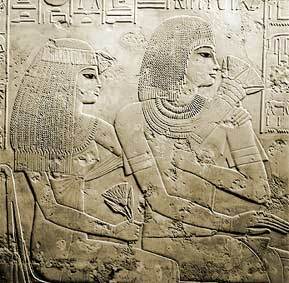 3 - Neby the father of Ramose, and Neby's wife - Apuaa. 4 - Ramose's brother - Amenhotep the 'Steward of the King's Palace at Memphis' and 'Master Craftsman' and his wife May. 7 - Figures bringing offerings. 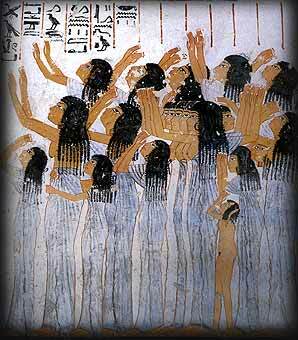 8 - Groups of mourners. 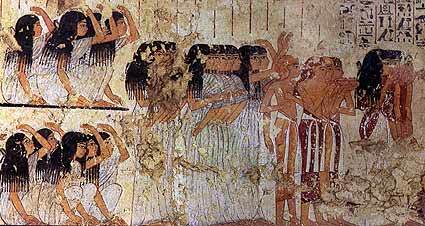 10 - Weeping women, and priestesses / funeral dancers. 11 - badly damaged figure of priests beforing the 'Opening of the Mouth' ceremony on the mummy of Ramose.